[Matt's Messages] "How Much More"
Last week, we studied the first half of Romans 5 and learned about the incredible blessings of justification: peace, grace, hope, love, salvation, God Himself. All of those little words that carry so much meaning. And they come to us through justification, being declared righteous because of what Jesus did for us on the Cross. And it just kept getting better and better, didn’t it? Well, in the second half of chapter 5, the apostle Paul tells the story of how it could be so good. 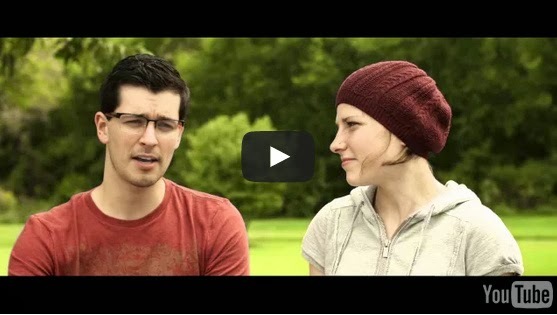 How the gospel could be such astonishingly good news for you and me. Just like last week, he begins with “therefore” which means that he is explaining something. And I think the thing Paul is trying to explain to us is how that HOPE that we talked about last week could be ours forever even though the story of the world had been so bad for so long. Paul reaches way back and tells the story of the world one more time. This time, not through the Patriarch Father Abraham, but even further back to the father of the whole human race, the man we know as Adam. All Roads Lead to Romans. Including the Adam road. From Genesis 3 to Romans 5. Paul here compares and contrasts what Adam did with what Jesus did. You know what Adam did, right? And you know what Jesus did, right? Or is one of them much greater? Now, last week, I said that verses 1 through 12 were really easy to understand. They were amazingly full of incredible, glorious truth, but all I had to do was read it to you and you could follow it. Verses 12 through 21 aren’t really like that. They are much more confusing. Paul’s argument is much harder to follow. But we will do our best! It’s still full of logic. Paul loves logic. Logic is what makes sense of the world to Paul, and it’s how he communicates. But like we said last week, it’s not cold logic. It’s logic on fire. And the two things being contrasted through most of this section are the things related to Adam and (how much more) the things related to Christ. Here’s the point. People have been messed up for a very very long time, ever since the very beginning. And it came through Adam. All of the blessings we learned about last week? All of the HOPE that Paul talked about had been dashed with Adam. But Jesus has come along and not only reversed what Adam did but He’s accomplished how much more! So much more. That’s the logic we’re going to see as we study it together this morning and apply it to our lives. Did you hear how complex Paul’s train of thought is? 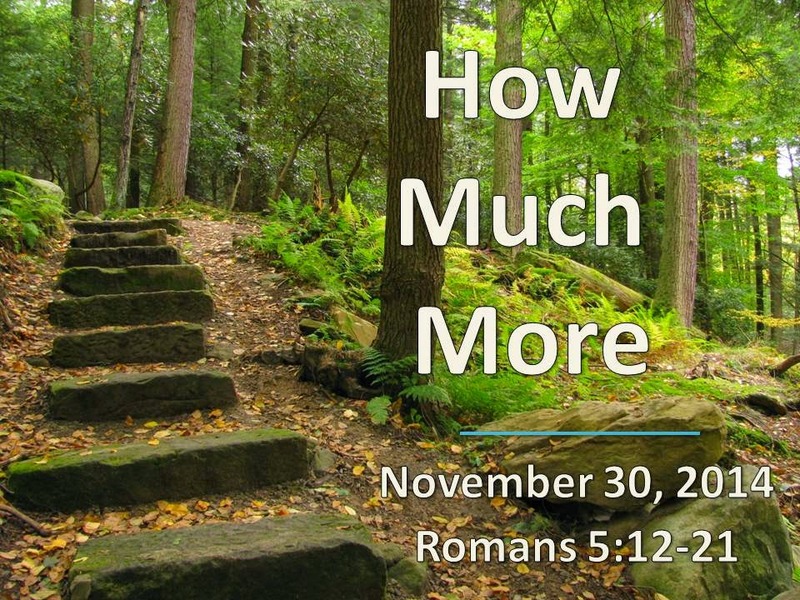 Did you hear all of “how much more” in there? The basic idea is very clear. You could make a chart of this passage like this. And under Adam, you can list all of the things that came from him and his sin in failing to lead Eve and choosing to disobey God in Genesis chapter 3. And under Christ, you could list all of the things that came from Him and His act of righteousness in living a perfect life and then sacrificing Himself for us on the Cross. And this column would be bad and this column would be good. Everything bad flows out of this column. And everything good flows out this one. Well, this is the story of what happened to you. Long before you ever were. And what will happen to you long after eternity comes. It’s the story of two very influential men. But Paul wants to say more than that. He wants to say that what happens in this column is much greater than what happens in this one. What? You’d expect him to say, “so also,” right? Just as, so also. That’s the logic. But Paul gets sidetracked by some thoughts he thinks need brought in before he can finish that thought. The completion of that thought comes in verses 18 and 19. But he’s got a few things to say first. So, let’s try to follow him. V.1 again. What column does that go in? What should we put in that column? Sin entered the world through Adam. Hello, sin. And what came in with sin? Death. Both spiritual and physical death. And not only death to Adam but to everybody. All of humanity sinned in Adam. We’re not sure exactly how that works. Perhaps, we were all spiritually present in Adam when he sinned. Or, more likely, Adam was representing us as the head of the human race when he sinned. And he did the sinning for us. Either way or some other, we are all sinners now that Adam has sinned. We all have sinful spiritual DNA inherited from our first father Adam. As Ephesians says, we are all dead in our trespasses and sins. We sin by nature and by choice and the consequence is death and more death. Spiritual and physical. And what column does all that go into? That’s a pretty heavy column. Sin and death, death to everyone, sin by everyone. I think what he means is that there might be some people who say, well, not everybody sinned. Because between Adam and Moses, there was no Torah, no law that sharply defined what was sin and what was not, so you can’t really say that everybody sinned until there was a law. He’s saying, it was still sin and we know that because of the death. Death reigned from Adam to Moses and that shows that everybody between those two was a sinner even if they were not transgressors like Adam. Even though they did not have the law. So, everyone is a sinner. Right? Paul says, “Everybody died, right?” Death reigned. But v.14 tells us that Adam was a “pattern” of the one to come. There was Someone to come whom Adam was a pattern of. And He gets a column all to Himself. Jesus Christ. Here’s where it starts to get good. You are supposed to compare these columns, but they don’t really compare! Now, I know that sounds a little corny, but I’ve got to do something to help us hear how much more is going on here. What does verse 15 say goes in Adam’s column? But the Jesus column is greater. V.15 again. Do you hear all of the grace words? God’s grace in Jesus is overflowing. The Greek word is “eperisseusen.” It’s directly connected to that word that caused me to pour a few jugs of water all over the floor up here a few years ago. Adam may have earned death for us, but Jesus GIVES AWAY His grace. Super-overflowing grace. How much more! What does Paul say goes in Adam’s column? What does Paul say goes in Christ’s column? Many sins fully paid for by the death of Christ and (our Romans word) “justification!” v.16 again. We think it’s something that Adam sinned and then we all fell down. We are all condemned because of Adam’s sin. But this is saying, that’s something but it’s really nothing. Think about all of the sins that have been committed. And think about how Jesus’ death was sufficient to pay for them all! Now, think about all of your sins. Past, present, and future. And think about how Jesus’ death was sufficient to pay for them all. So that you are justified. Just by believing! Just by faith alone in Jesus alone! That’s what we’ve been learning about in Romans. How much more effective is the gift of Jesus than the sin of Adam! What goes in the Adam column? Death reigning. I don’t know about you, but that sounds big. The reign of death. The rule of death. The dominion of death. All out of the one man Adam and his one big sin. I know that sounds kind of comic-book-ish, but forgive me, I can’t find words amazing enough to get it across. Notice that in the Christ column, it’s not that life reigns, though he could have said that, but that Paul says that WE will reign! “[T]hose who receive God's abundant provision of grace and of the gift of righteousness” will reign in life! We will reign in life! When Christ returns, we will reign forever! We will live forever and share in Christ’s reign! Everything that Adam was supposed to be and do as the ruler of the Earth but lost for himself and for humanity will be restored to us in the End. Death will not reign. We will. I’ve said it before and many times this year, I’m so tired of death. We live under the specter of death. Death reigns right now. Today is my friend Danny Mendez’s birthday. And it’s his first birthday since his wife died a few weeks ago. I did 9 funerals in the last year. Many of you sat down to Thanksgiving dinners for the first time without a loved one who died. And the world we live in is profoundly broken. Whatever you think happened there between Wilson and Brown, you know that it’s not the way things ought to be. The world is under the rule of death. But life has broken through! Notice that you have to receive it. You have to receive God’s abundant provision of grace. To be included in Adam, you only had to be born. But to be included in Christ, you must believe. And if you believe, you receive the gift of righteousness, justification by faith. And then you will reign and rule in life. A bit now and fully to come. Now in verse 18, Paul gets back to finishing the thought that he started in verse 12. The Adam column has one big sin whose result was condemnation for all men in Adam. And the Christ column is one act of righteousness (the Cross) whose result was justification that brings life to all men in Christ. And he puts it in other words in verse 19. This is the story of you. It’s what happened to you. You were in Adam and you were getting all that Adam’s column offers, but if you received Jesus’ and His gift, then you get all of what His column offers, as well. And His column is so much greater! One more. #4. SUPER-INCREASING GRACE. Someone might say, but what about the Law? Paul cares deeply about the Law (as we saw in verse 13). Paul, you tell us the story of the world starting with Adam and then going to Jesus. What was the point of the Law then? I think that what he’s saying is that the Law came about to intensify sin by showing how sinful it is. You instinctively feel that you shouldn’t steal, but when someone in authority says, “Don’t steal.” then you really feel how bad it is to steal. And you really feel like stealing. Don’t you? So sin intensifies and multiplies because the Law has arrived. The Greek word here is, “hupereperisseusen” and it’s even more overflowing than the grace in verse v.15! Sin reigned in death, but now grace reigns through righteousness. Now, we who are believers in Jesus are dominated by grace! We are ruled by grace! By an ever increasing grace. Grace increased all the more! Do you know that because you belong to Jesus, you are ruled by an every increasing grace? Paul is going to have much more to say about this in chapters 6, 7, and 8. We will get to them at the first of the year, Lord-willing. He’s going to have to answer the question that naturally comes up, if grace increases with the increase in sin, maybe we should sin some more to make grace increase even more. But that’s nonsense, of course. No, because we see how sinful we are, we give even more glory to God because of how much grace we see we need and how much more grace-filled God is than we even needed. Super-increasing grace calls for songs of loudest praise. Do you see what Paul has done? He has told the story of the world. How the world went wrong with Adam. And how sin and death have dominated our world for all of human history. The Adam column. But now something greater has come. Super-Overflowing Grace, because of His gift. Super-Effective Justification, paying for all of our sins. and Super-Increasing Grace, that reigns through righteousness. All of our hopes restored and so much more. Same two points of application as last week. #1. Put your faith in Jesus to be justified. Because you don’t move from the Adam column to the Christ column without going through verse 17. Only those who put their faith in Jesus get this grace, this justification, this life, this reign. It’s so good! But you have to choose it. You have to put your faith in Christ alone. And #2. Rejoice, rejoice, rejoice! Because of how much more greater Jesus is has accomplished on our behalf. We have every reason to rejoice. For the last two posts, we have been learning about two related words, psithurismos and katalalia, which figure in to our understanding of gossip in the New Testament. Yesterday, we learned that katalalia is the bigger category of which psithurismos is the sub-category that specifically means behind-the-back gossip. The larger category, katalalia/katalalos, including its verb form, katalaleo, appears elsewhere in the New Testament. The apostle Peter urges his readers, in light of the gospel, to lay it aside. “Therefore, rid yourselves of all malice and all deceit, hypocrisy, envy, and slander of every kind [katalalias]” (1 Pet 2:1).61 In this context, “evil speaking” (KJV) is closely connected with heart attitudes, especially of what could be called “the anger family” of sins. Gossip often is an expression of anger. We should also notice in verse 11 that katalaleo is linked with judging not only our brothers but also the law itself. Whenever we disobey a law, we are saying, in effect, that we think it is a bad law. A gossiping person can become a law unto themselves. A similar phenomenon, without the katalalia/los/leo word group, appears a few verses later in James 5. “Don’t grumble against each other, brothers, or you will be judged. The Judge is standing at the door!” (Jas 5:9). The word for grumble is stenazo which means to “sigh or groan.”66 It is a form of moaning and complaining about each other that is often the content of gossip. James again connects this grumbling with judgment–this time with their impending judgment! When Christ returns, do we want to be found groaning about our fellow believers? Peter, using this same word, also says to expect that the pagans will speak against and accuse the Christians (1 Pet 2:12, 3:16). R. V. G. Tasker, The General Epistle of James: An Introduction and Commentary, TNTC 16 (Grand Rapids: Wm. B. Eerdmans Publishing, 1983), 99. Douglas J. Moo, The Letter of James, PNTC (Grand Rapids: Wm. B. Eerdmans Publishing, 2000), 199. The rest of Moo’s discussion of this passage is very helpful and repays careful reading. He connects these two verses both with the near context of chapter 4 and with themes that run throughout James’ epistle, including sins of the tongue (Jas 3:2-12) and conflicts (Jas 3:13-4:2). Ralph P. Martin, James, WBC 48 (Nashville, Thomas Nelson, 1998),163. R. Kent Hughes, James: Faith that Works, Preaching the Word (Wheaton: Crossway, 1991), 194. George M. Stulac, James, IVPNTC 16 (Downers Grove: Inter-Varsity Press, 1993), 172. H. Wahrisch, C. Brown, “blasfhme,w,” NIDNTT 3:341-345. H. Wahrisch, “loi,dorew,” NIDNTT, 3:346-347. Of these three, only kathgore,w is used in both a positive and negative way. Some accusations are appropriate (John 5:45), however, kathgore,w is used most often as the work of Satan and those who opposed Jesus and the apostles. The best place to start for a comprehensive study of these key words is the set of articles on “Revile, Blaspheme, Slander” in NIDNTT 3:340-347. "A psalm. For giving thanks. We are analyzing the Greek words commonly translated "gossip" and each New Testament passage in which they occur on our way to developing a biblical definition of gossip. Yesterday, we were introduced to two bad words, "Psithurismos" and "Katalalia,"
How Are "Psithurismos" and "Katalalia" Related? C. E. B. Cranfield, The Epistle to the Romans, Volume 1:1-8, ICC (Edinburgh: T&T Clark, 1980), 130-131. Douglas J. Moo, The Epistle to the Romans, NICNT (Grand Rapids: Wm. B. Eerdmans Publishing, 1996), 120. John Calvin, The Epistles of Paul the Apostle to the Romans and to the Thessalonians, ed. David W. Torrance and Thomas F. Torrance, trans. Ross Mackenzie, Calvin’s New Testament Commentaries 8 (Grand Rapids: Wm. B. Eerdmans Publishing, 1973), 38. R. V. G. Tasker, The Second Epistle of Paul to the Corinthians, TNTC (Grand Rapids: Wm. B. Eerdmans Publishing, 1971), 185. We are analyzing the Greek words commonly translated "gossip" and each New Testament passage in which they occur on our way to developing a biblical definition of gossip. 1. Psithurismos/psithuristas and katalalia/katalalos. The first word, psithurismos, literally means “hiss, whisper” and in the New Testament is used “only in a bad sense whispering, (secret) gossip, tale-bearing.”52 The related form, psithuristas, is therefore, “whisperer, tale-bearer.”53 It is similar to the Hebrew word nirgan we encountered in the Old Testament. In both of their New Testament uses, these Greek words always appear in very close proximity to katalalos (“speaking evil of others, slanderous” used substantivally “slanderer”)54 or its related form katalalia (“evil speech, slander, defamation, detraction”).55 The two words seem to be connected. In Romans 1, the apostle Paul has begun his grand exposition of the gospel of God. He is declaring the universal sinfulness of humanity and, in specific, the depravity of the Gentiles. Paul ends his first chapter by listing the sins of the depraved mind. “They have become filled with every kind of wickedness, evil, greed and depravity. They are full of envy, murder, strife, deceit and malice. They are gossips [psithuristas (plural)], slanderers [katalalous (plural of katalalos)], God-haters, insolent, arrogant and boastful; they invent ways of doing evil; they disobey their parents; they are senseless, faithless, heartless, ruthless” (Rom 1:29-31). Gossip is not a minor sin. It shares space in a list with every other kind of wickedness deserving the wrath of God. “Although they know God’s righteous decree that those who do such things deserve death, they not only continue to do these very things but also approve of those who practice them” (Rom 1:32). Similarly, in 2 Corinthians 12, Paul uses these two words right next to each other (though in opposite order) in a list of vices that he fears will be present in the church in Corinth when he returns. “For I am afraid that when I come I may not find you as I want you to be, and you may not find me as you want me to be. I fear that there may be quarreling, jealousy, outbursts of anger, factions, slander [katalaliai, (plural of katalalia)], gossip [psithurismoi56 (plural of psithurismos)], arrogance, and disorder” (2 Cor 12:20). While the list in Romans 1 was about sinners in general, this vice list is more specific to dissension, disunity, and discord among the church in Corinth. Gossip divides Christians. When Paul returns on his third visit, for the edification of the church, he will have to exercise painful discipline unless the Corinthians examine themselves and repent (2 Cor 12:21-13:10). If someone has engaged in sinful gossip, the only way forward is repentance. Interestingly, this is the first place in our study of gossip throughout the Bible where a key term is used to describe the phenomenon of gossip itself and not the kind of person who engages in it. The Bible seems to be more interested in teaching us what kind of people to be than in giving us precise ethical definitions of what behavior is acceptable or unacceptable. As our study of gossip in the Old Testament centered upon the book of Proverbs, our study of gossip in the New Testament will focus mainly on the epistles. Gossip is denounced as much in the New Testament as, if not more than, in the Old Testament. Whenever it appears, gossip is viewed as negative, shameful, unrighteous, and undesirable. In what follows, we will study three sets of Greek word groups usually translated in English versions as “gossip,” “gossips,” “gossiping.” We will analyze each occurrence of these words, give exposition of the context and content of the surrounding teaching, and also note related terms and phenomena. This is our last stop on our tour of the Old Testament in our series of fragments from my D.Min project showing how I arrived at my definition of gossip. We've been learning about phenomenon in the Old Testament we might call "gossip" even when a technical term is not used. Today's post is about the fourth of four important and related concepts, along with exposition of key texts. Question 145 of the Westminster Larger Catechism says, “The sins forbidden in the ninth commandment are . . . speaking untruth, lying, slandering, backbiting, detracting, talebearing, whispering.” Johannes Geerhardus Vos, The Westminster Larger Catechism: A Commentary, ed. G. I. Williamson (Phillipsburg, NJ: P & R Publishing, 2002), 394. Much more could be said about gossip in the Old Testament, including a survey of stories of gossip in action in the Pentateuch, History Books, and Prophets. All of the principles we have learned so far are illustrated in the garden, the land of promise, the wilderness, the conquest, the kingdom, and the exile. Johannes Geerhardus Vos, The Westminster Larger Catechism: A Commentary, ed. G. I. Williamson (Phillipsburg, NJ: P & R Publishing, 2002), 394. I find this kind of ethical extrapolation from the 10 Commandments to be helpful for moral instruction even if I do not share all of the hermeneutical assumptions of covenant theologians. 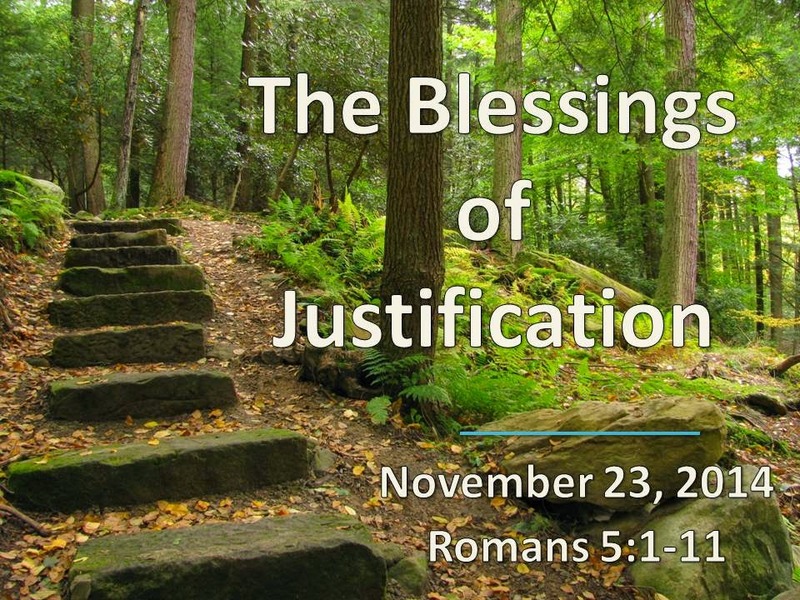 [Matt's Messages] "The Blessings of Justification"
I love how the Lord has orchestrated this passage to be for this Sunday. I didn’t plan it that way, but Somebody did. Because this passage is so full of blessing. It’s an explosion of blessing. Which is just perfect for the Sunday right before Thanksgiving when we concentrate our celebration of all of the blessings that God has given us. Well, we’re going to do that today in Romans 5, verses 1 through 11. And they are just breathtaking! I could easily preach 10 or 12 messages on these 11 verses. It wouldn’t be hard at all to spend a full quarter of a year on Romans 5:1-11. It’s just that good. In fact, I ended up with a 6 point sermon for today. Don’t worry. They’re brief points, but I could have made it an 10 or 11 point sermon! There is just so much goodness here in just 11 verses. And one of the great things about this astonishing passage is that it isn’t hard to understand. Unlike other parts of Romans! All I have to do is read these verses to you, and you’ll get it. Especially because for most of you, this is not the first time you’ve heard them. And that’s what I’m going to do. I’m going to read all eleven verses. And here’s what I want you to listen for as I read. Listen for “justification.” Because that’s been the theme of the letter so far, hasn’t it? Listen for how all of these blessings flow from our justification by faith in Jesus. And also listen for all of the logic words. Paul is a logician. Listen for the words that indicate his logical argument. The “therefores” and the “how much mores” and the “not only that buts” and so forth. Because all of those are important for getting the message that Paul and, more importantly, God have for us to hear. Ready? Here we go. Romans chapter 5, verses 1 through 11. Did you hear those logic words? And did you hear the tone of exultation? There is so much praise and rejoicing and wonder going on in these eleven verses! Paul is just bursting with joy in the blessings of justification. Did you catch that word justification again? Chapter 5 is the next step in Paul’s argument. He hasn’t left his explanation of the gospel of grace. He’s taking it to the next level. There is a shift going from chapters 1-4 to chapters 5-8, but the thing that ties them together is justification. Righteous-ification. That’s what Paul has been talking about since chapter 1. In the gospel of grace, God solves our righteousness problem and His righteousness problem. Our righteousness problem is that we are unrighteous and that invites the holy wrath of God. God’s righteousness problem was that He had forgiven His faith-followers their sins before the Cross opening Him up to the charge of injustice. And at the Cross, He solved our problem and His. And then last time in chapter 4, we saw that Paul defended this idea of justification by faith alone by using the illustration of Father Abraham. That’s a radical idea. Justification by faith in Jesus alone. And now Paul will show us what that leads to. See the logic? Since we have this justification, this righteousness coming to us by faith alone and not through moral effort, we have peace with God. That’s amazing. He’s going to say more about this peace in verses 10 and 11. There, he’s going to call it reconciliation. Because of our justification, we are no longer at war with God. Everything we read about in the Bad News section of Romans about the wrath of God that is coming on those who are unrighteous and disobedient? That’s over now for those who are justified. God is no longer our enemy. We are at peace. You don’t God as your enemy. Who do you think will win that one? Who wants to go to war against and omnipotent enemy? Well, stupid sinners do. Sin is irrational and unreasonable. We have made war against God. But Jesus has become our peace. Verse 1 again. It’s because of Him. As we count our blessings this Thursday, we need to realize that they all come through Jesus. It’s through Jesus that we have “gained access” into grace. Notice, again, that’s “by faith.” This is not something we earned. It’s grace! And notice also that this grace is something in which we “now stand.” It’s a free place to stand. It’s a new standing. Not something we have done. Not a place we took ourselves to. But something Jesus has done. A place to stand made by Jesus for us. They should be. They’re right up here. When Kathy Moore asked me what scripture verses to put on the praise banners, this was my first recommendation for her. In many ways, this is the next big theme for the book of Romans. He’s going to talk a lot about the hope of every Christian in the next four chapters. And our hope comes from our justification. The idea is that we are so blessed and so excited about that blessing, that it just erupts out of us. And what do we rejoice in? The hope of the glory of God. Remember, this is not hope as a wish. This is hope as a sure future. Something that we don’t have yet but we KNOW is coming. Sharing in the glory of God. Living in the glory of God. Where we become like God because we see Him as He is. No longer are we falling short of the glory of God. Now, we look forward to the glory of God. So much so, that we rejoice even though it’s not here yet like it will be! In our sufferings? In our trials? In our tribulations? In our problems? Hey, Paul, this is Thanksgiving season. We don’t want to think about that tough stuff. The justified know that our sufferings are for a purpose. And the end result is more hope. We don’t rejoice in our sufferings because we like pain. Christians are not masochists. But we do rejoice even in sufferings because we know that they will produce more hope in us. Paul gives us a chain of events that happens for all truly justified believers. It’s very similar to the one in the first chapter of James which Alex Ielase taught us about in August. First, we suffer. We go through hard things. Happens to everyone, including believers. But believers are justified. They are righteous by faith in Jesus. And they believe. They trust. They put their hope in God. And when they do. When we do, it produces perseverance. Anybody want to guess what the Greek word is here translated “perseverance” in the NIV and “patience” in the King James? Remember Alex making us repeat that word? It’s stick-to-it-iveness. It’s endurance. It’s holding on. The justified hold on. And that forms their character. They change. Believers become more like Jesus over time. And when they look the changes that God is working in them, however, imperfect they are, they know that what they hope for us coming. And what they hope for us the total transformation of their lives into the image of Christ. Their glorification. We will not be ashamed on that day. We know that what we hope for us coming. It will not disappoint. And how do we know? Because the Holy Spirit tells us so. God has taken the great big pitcher, the hugemongous jug of the water of His love and poured it into our hearts. Remember when we started Romans, I challenged you to write it on a card and repeat it into the bathroom mirror? And the Holy Spirit Himself pours that knowledge into our hearts. This is how the justified are loved. We are loved before we are justified. When we were powerless, weak, helpless, and ungodly, Jesus died for us. “God demonstrates.” Notice that that’s present tense. He is demonstrating right now His own love for us in this: back then while we were still His enemies, Jesus died for us. Now, I know that you know this. We talk about this all the time. But don’t let it slide by without marveling. I would die for my children. I would die for my wife. I might die for a stranger if I thought it was the right thing to do. But to die in the place of the one who wants me dead? The one who is my enemy? Amazing love, how can it be? That you my King would die for me? But that’s not all. There are even more blessings of justification. Not just initial justification but salvation from the wrath of God in the future. Do you hear the logic? If God has already done the hard thing of sacrificing His One and Only Son for us, then how easy it will be for Him to shield us from the wrath to come. Our justification has led to our reconciliation. We have (v.1) peace with God. We are no longer enemies. We are friends. We are no longer separated. We are together. We are not longer estranged. We are reconciled. And we have been reconciled by Jesus’ death, how much more will be saved through His resurrection life?! How’s that for a blessing of justification? Safe from the wrath of God. FOREVER. Can you believe it? It gets even better than that. Here’s blessing number six. We don’t just rejoice in the hope of the glory of God or in the knowledge that our sufferings have a purpose. We don’t just rejoice that we stand in grace or that we are loved or even saved from the wrath God. We rejoice. We exult. We boast. We praise because we get God Himself! Again, through our Lord Jesus Christ. He’s the One that makes it all possible. He’s the One from whom all these blessings of justification flow. Two points of application and then we’ll sing it! First: PUT YOUR FAITH IN JESUS TO BE JUSTIFIED. All of these blessings come to those who have been justified by faith (v.1) and by His blood (v.9). They do not come those who have not put their faith in Jesus and His blood. If you are not trusting in Jesus, you are not a peace with God. You are not standing in grace. You have no hope of the glory of God. Your suffering is to no eternal purpose. The love of God has not been poured into your heart. You cannot rejoice in God. You cannot sing the songs we’ve sung today. Turn from your sins and trust in the Savior, our Lord Jesus Christ. Turn away from trying to earn God’s favor because justification is not by works. It’s by faith. Put your faith in Jesus to be justified, and you will receive all of this! And second application: REJOICE, REJOICE, REJOICE! Raise your voice with Paul and rejoice in the hope of the glory of God! Rejoice even in your sufferings because they will end up giving you more hope. Rejoice in God (and all that He is and does and gives) through our Lord Jesus Christ. Rejoice in the blessings of justification. Our series towards a biblical definition of gossip continues through the phenomenon in the Old Testament we call "gossip" even when a technical term is not used. Today's post is about the third of four important and related concepts, along with exposition of key texts. Meddling In Others’ Business. Proverbs 26:17 says, “Like one who seizes a dog by the ears is a passer-by who meddles in a quarrel not his own.” The image in the first part of the proverb almost grabs the reader like the fool it describes! 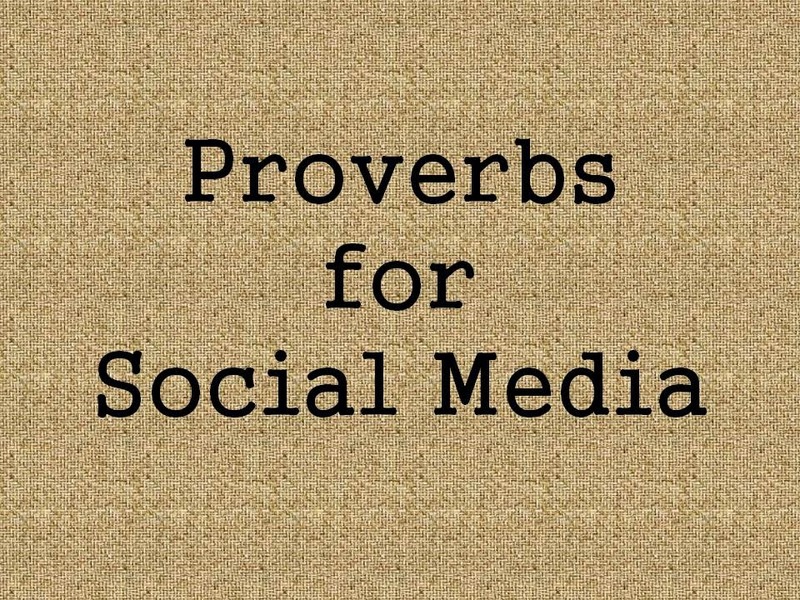 The point of the proverb is to motivate its readers to mind their own business and not meddle in others’. Waltke explains, “The dispute, which itself entails getting hurt (see 17:14), is likened to a semiwild dog. . . . Grabbing it by its sensitive ears connotes the inevitability of getting hurt in the needless dispute. . . . The senseless busybody should leave the passing cur alone, and the disciple should walk away from a dispute in which he has no interest.”48 We will see that the theme of minding one’s own business will be amplified in the New Testament (1 Thess 4:11, 2 Thess 3:11, 1 Tim 5:13). Bruce K. Waltke, The Book of Proverbs: Chapters 15-31, NICOT (Grand Rapids: Wm. B. Eerdmans Publishing, 2005), 359. Our series towards a biblical definition of gossip continues through the phenomenon in the Old Testament we call "gossip" even when a technical term is not used. Today's post is about the second of four important and related concepts, along with exposition of key texts. Bad Reports. A Hebrew term seldom translated “gossip” in English versions42 but clearly related is dibbah.This word can mean “whispering, defamation, evil report.”43 It sometimes refers to a true report of some evil action, but can also refer to “a report slanted to damage the victim.”44 Dibbah is what Joseph brought to Jacob about his brothers in Genesis 37:2. It is likely that his ten brothers were doing wrong, so Joseph may not have been lying, but he was at least being an annoying tattletale.45 Dibbah is also what ten of the Israelite survey team brought back after spying out the land of Canaan (Num 13:32, 14:36-37). Clearly what they said was wrong–not that the facts about the land and its inhabitants were inaccurate, but their assessment of what God could and would do was evil. Gossip is not just what you say but how you present it. Dibbah appears in Proverbs 10:18, “He who conceals hatred has lying lips, and whoever spreads slander [dibbah] is a fool.” Waltke explains, “The enjambment of v.18 combines the liar . . . with the slanderer as the compound subject with one predicate. The construction leaves no doubt that hatred inspires slander informed by innuendoes, half-truths, and facts distorted and exaggerated beyond recognition (cf. 6:17, 19). In other words, this fool spreads slander, concealing his hatred with lying lips.”46 Interestingly, Waltke draws attention (by quoting Ted Hildebrandt) to the preponderance of sibilants in this verse (six times) so that its message is amplified by a long hissing sound as it is read.47 Sharing an injurious report with others is foolish. The very next verse suggests one antidote to gossip–keeping your mouth shut. “When words are many, sin is not absent, but he who holds his tongue is wise” (Prov 10:19). Dibbah is used again in Psalm 31, “For I hear the slander of many; there is terror on every side; they conspire against me and plot to take my life” (Ps 31:13, v.14 in Hebrew). David is under attack, and this time it includes evil reports which have reached his ears. They might be just malicious rumors, but they are terrifying to the king. The one exception is Ezekiel 36:3 in the ESV. “Therefore prophesy, and say, Thus says the Lord God: Precisely because they made you desolate and crushed you from all sides, so that you became the possession of the rest of the nations, and you became the talk and evil gossip of the people . . . the nations that are all around you shall themselves suffer reproach” (Ezek 36:3,7). Israel may have deserved this evil report, but the nations gloried in it, and for that they will be repaid. Bruce K. Waltke, The Book of Proverbs: Chapters 1-15, NICOT (Grand Rapids: Wm. B. Eerdmans Publishing, 2004), 470. Tattling is, therefore, a form of gossip. It is gossiping to someone in authority instead of to someone uninvolved. The action of tattling is wrong because the motive is. Ambiguity of discerning motives can then make it difficult for authority figures, including parents, to diagnose tattling as sin. But most loving parents can tell anyway because they know their children well. For more on dibbah in Genesis 37:2, see Bruce K. Waltke and Cathi J. Fredricks, Genesis: A Commentary (Grand Rapids: Zondervan, 2001), 499; Victor Hamilton, The Book of Genesis: Chapters 18-50, NICOT (Grand Rapids: Wm. B. Eerdmans Publishing, 1995), 406; Gordon J. Wenham, Genesis 16-50, WBC 2 (Waco: Word Books, 1994), 350. Bruce K. Waltke, The Book of Proverbs: Chapters 1-15, NICOT (Grand Rapids: Wm. B. Eerdmans Publishing, 2004), 469. A new video introducing both our favorite band and their upcoming new release. The background music will sound familiar to those who have viewed The Resisting Gossip Teaching Series! but delights in airing his own opinions." My kids found this in one of the books they're reading for school. The caption says, "A German 'mask of shame' worn by women found guilty of gossiping." 1. Where is the corresponding mask for men found gossiping? 2. What kind of gossip qualified a lady for this costume? Slanderous? Idle? Malicious? Careless? 3. I'm sure this was effective at curtailing the outward behavior, for a time, for certain folks. But it probably pushed the gossip into even more sneaky modes because it doesn't really get at the core problem. 4. The worst part of this approach, I think, is that it's not redemptive. There is no place to go with the shame. Thankfully, followers of Christ have a safe place to run. Our series towards a biblical definition of gossip moves on from the Hebrew words most often translated "gossip" to other phenomenon in the Old Testament we call "gossip" even when a technical term is not used. Today's post is about the first of four important and related concepts, along with exposition of key texts. The rest of the Old Testament bears this out. Listening is vitally important, and if we listen to the wrong people or in the wrong way, there will be disastrous consequences. Adam “listened” to his wife, and it resulted in the curse (Gen 3:17). Proverbs 29:12 says, “If a ruler listens to lies, all his officials become wicked.” Evil listening is contagious. Proverbs 25:26 says, “Like a muddied spring or a polluted well is a righteous man who gives way to the wicked.” A compromise in listening will sully your soul. Eugene H. Peterson, The Message: New Testament With Psalms and Proverbs (Colorado Springs: Navpress, 1995), 900. Bruce K. Waltke, The Book of Proverbs: Chapters 15-31, NICOT (Grand Rapids: Wm. B. Eerdmans Publishing, 2005), 41. Derek Kidner, Proverbs, TOTC 15 (Downers Grove: Inter-Varsity Press, 1971), 123. 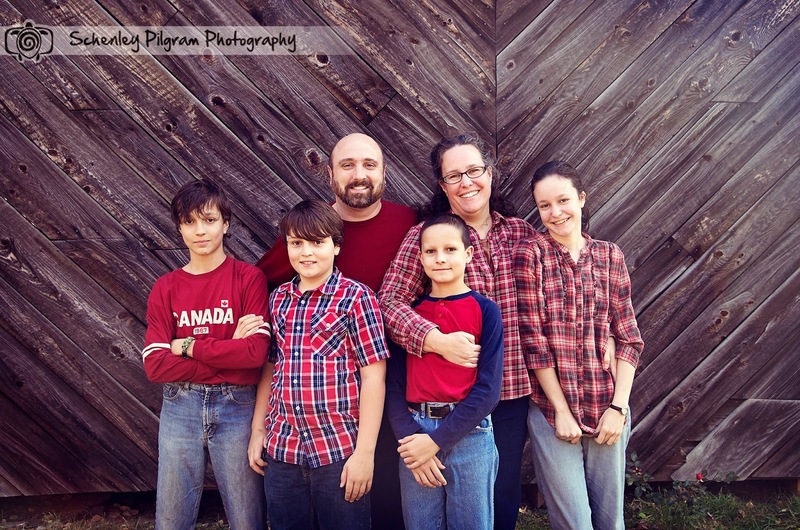 New family photo courtesy of Schenley Pilgram Photography. Our series continues towards a biblical definition of gossip, starting with a tour of the Old Testament and the Hebrew words most often translated "gossip." Libo Yiqebbats Aven Lo Yetse Lahuts Yedabber. “Gathering Gossip and Spreading It.” Psalm 41 is a plaintive song about experiencing the pain of gossip. King David seems to have experienced a debilitating illness, and some of his associates, instead of encouraging and supporting him, eagerly look for his downfall. “My enemies say of me in malice, ‘When will he die and his name perish?’” (Ps 41:5). David has gotten word of what they are saying about him. “All my enemies whisper38 together against me; they imagine the worst for me, saying, ‘A vile disease has beset him; he will never get up from the place where he lies’” (Ps 41:7-8). Gossip does not come from love, but from hate. It imagines the worst for its subject and publishes it abroad. Gossip is treachery. David laments, “Even my close friend, whom I trusted, he who shared my bread, has lifted up his heel against me” (Ps 41:9). This prefigured the betrayal of great David’s greater Son, the Lord Jesus (John 13:18-30). The answer to this kind of gossip is faith in the LORD. “But you, O LORD, have mercy on me; raise me up, that I may repay them. I know that you are pleased with me, for my enemy does not triumph over me. In my integrity you uphold me and set me in your presence forever. Praise be to the LORD, the God of Israel, from everlasting to everlasting. Amen and Amen” (Ps 41:10-13). Eugene H. Peterson, The Message: New Testament With Psalms and Proverbs (Colorado Springs: Navpress, 1995), 708. This is a different Hebrew word for “whisper” than what we have seen already, but the effect is the same. We are working towards a biblical definition of gossip, starting with a tour of the Old Testament and the Hebrew words most often translated "gossip." First was rakil, the spy. Second was nirgan, the grumbling whisperer. Lashon Seter. Modern paraphrases use the English word “gossip” in a few places where neither rakil nor nirgan is present. Proverbs 25:23 says, “As a north wind brings rain, so a sly tongue brings angry looks.” The NLT glosses, “As surely as a wind from the north brings rain, so a gossiping tongue causes anger!” The Message offers, “A north wind brings stormy weather, / and a gossipy tongue stormy looks.”30 The Hebrew phrase is: lashon seter. Lashon means “tongue.”31 Seter means “covering, hiding-place, secrecy.”32 Put together, they refer to “a tongue of secrecy.” The offending speech is hidden, sly, furtive, stealthy. The phrase lashon seter appears also in Psalm 101 where David vows to exclude unrighteous people from his household, city, and kingdom. He says, “Men of perverse heart shall be far from me; I will have nothing to do with evil. Whoever slanders his neighbor in secret,35 him will I put to silence; whoever has haughty eyes and a proud heart, him will I not endure” (Ps 101:4-5). The word lashon is used as a verb again in Proverbs 30:10 but without the slyness of seter, “Do not slander [lashon] a servant to his master, or he will curse you, and you will pay for it.” It is not clear if this is gossip in the clandestine sense, but it does demonstrate again the power of the tongue and its evil effects. Malicious speech upsets the order of things and has inevitable injurious consequences. 30 Eugene H. Peterson, The Message: New Testament With Psalms and Proverbs (Colorado Springs: Navpress, 1995), 923. 33 Bruce K. Waltke, The Book of Proverbs: Chapters 15-31, NICOT (Grand Rapids: Wm. B. Eerdmans Publishing, 2005), 333. 36 Charles H. Spurgeon, The Treasury of David: An Expository and Devotional Commentary on the Psalms (Grand Rapids: Baker Book House, 1978), 5:406.